As expected, Google today introduced its latest flagship smartphones, the Pixel 3 and Pixel 3 XL. 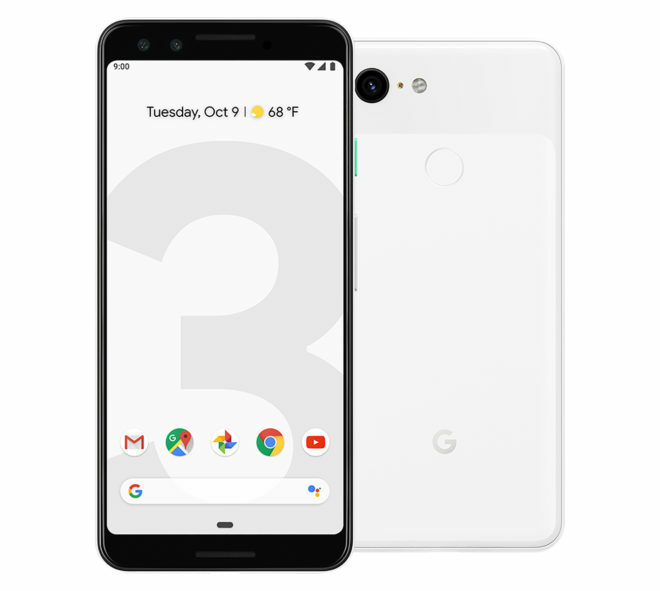 The Google Pixel 3 and Pixel 3 XL feature larger displays than last year’s Pixel 2 and Pixel 2 XL, with the Pixel 3 offering a 5.5-inch FHD+ display and the Pixel 3 XL moving up to a 6.3-inch QHD+ display. Both panels are of the OLED variety, but while the Pixel 3 has bezels at the top and bottom of its screen, the Pixel 3 XL has a notch at the top of its display, just like the leaks predicted. Camera performance has been a focus of past Pixel phones, and that’s the case again with the Pixel 3 and Pixel 3 XL. Both phones have a single 12.2MP rear camera with 1.4um pixels, optical and electronic image stabilization, and an f/1.8 aperture. Google has built in some new features to take advantage of that camera, like a Top Shot feature that’ll capture alternate HDR+ shots when you take a motion photo and recommend the best one. Super Res Zoom uses computational photography to give you sharp details when you zoom, and Night Sight will help you take natural-looking photos in low light. Google is also rolling out a Photobooth feature that uses AI to recognize when you’re smiling in a selfie and will automatically take a photo, meaning you don’t need to press the shutter button. Also included in the Pixel 3 and Pixel 3 XL are dual front-facing 8MP cameras. One of the cameras is a wide-angle sensor with a 97-degree field of view, which should help you to fit more people into your selfies. The other 8MP sensor has an f/1.8 aperture and 75-degree field of view. Inside the Google Pixel 3 and Pixel 3 XL is a Snapdragon 845 processor, 4GB of RAM, and either 64GB or 128GB of built-in storage. Google has equipped the Pixel 3 with a 2915mAh battery, while the larger Pixel 3 XL comes with a 3450mAh battery. Both phones also offer a rear fingerprint reader, USB-C, and wireless charging, but one thing that they lack is a 3.5mm headphone jack. They do offer dual front-firing stereo speakers for pumping out sound without headphones, though, and Google says that these speakers are 40 percent louder. 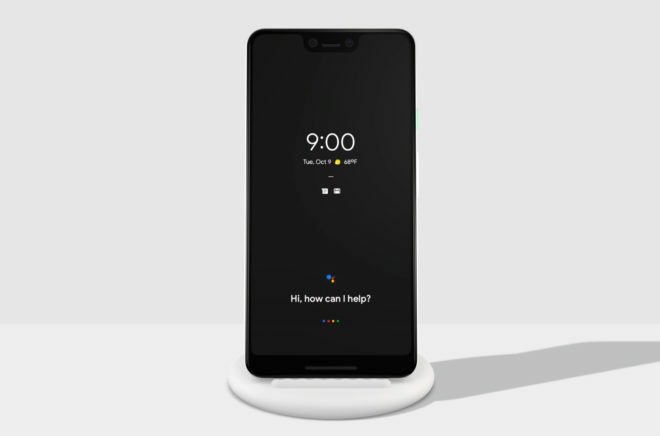 Other notable features of the Pixel 3 and Pixel 3 XL include an a feature to screen calls and avoid spam calls, as well as Google Duplex, an experimental Google Assistant feature that can help complete tasks like calling to make a restaurant reservation. This feature will roll out later this year in New York City, Atlanta, Phoenix, and San Francisco. Also of note is a Flip to Shhh feature on the Pixel 3 phones that’ll let you place your phone face down to quickly silence it and mute incoming notifications. 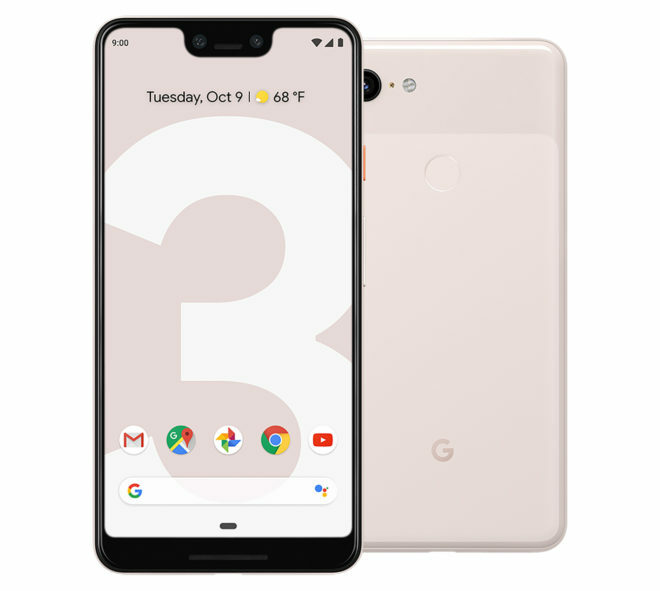 When it comes to wireless connectivity, the Google Pixel 3 and Pixel 3 XL include support for LTE bands 2, 4, 5, 12, 66, and 71, as well as features like 5x DL CA, 4×4 MIMO, 256 QAM for downloads and 64 QAM for uploads. The full list of supported LTE bands on the new Pixel phones includes 1, 2, 3, 4, 5, 7, 8, 12, 13, 17, 18, 19, 20, 25, 26, 28, 29, 32, 66, and 71. Google also announced a new Pixel Stand accessory for the Pixel 3 and Pixel 3 XL. This device will wirelessly charge your Pixel phone while also standing it upright, making it easy for you to see your incoming notifications while your phone is charging up. It’s also got some special features when your Pixel 3 XL is charging on the stand, like an ambient light mode that mimics the sunrise before your alarm goes off in the morning and the ability to show your schedule, traffic info, and news. The Pixel Stand can also show cycle through Google Photos. It’s now available for pre-order for $79. 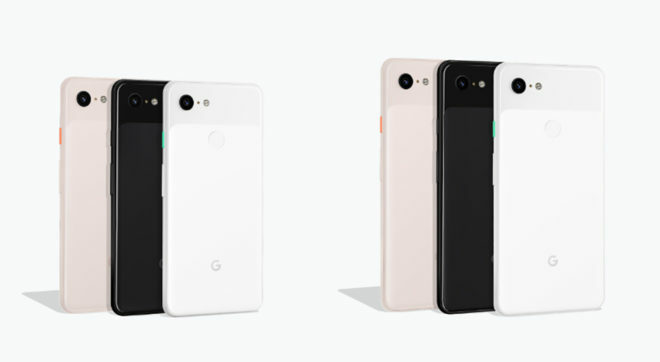 The Pixel 3 and Pixel 3 XL are available in Just Black, Clearly White, and Not Pink color options. Customers who purchase one of the new Pixel phones will get unlimited original-quality photo storage in Google Photos through January 31, 2022, and if you buy before December 31, 2018, you’ll also get six months of free YouTube Music Premium. So there are Google’s new Pixel 3 and Pixel 3 XL phones. It’s another year of Verizon being the exclusive U.S. carrier, but the good news is that Google is once again selling its phones unlocked. T-Mobile doesn’t appear to be offering a deal for customers who bring the Pixel 3 or Pixel 3 XL onto their network as they did in past years, but perhaps we’ll see a deal announced soon. What do you think of the Pixel 3 and Pixel 3 XL? WIll you be buying one? Overpriced and ugly. I’ll have to pass on these. Verizon nails the contract again!!! This is getting so old!!! I bet TMo will have a deal to bring your Pixel 3 to them though. Was going to be excited, but I think I’ll stick with the note 9. Unfortunately when you put the $1000 Pixel 3 XL next to the $1000 Note 9, the Pixel 3 XL comes up short in processing power, battery size/life, screen size, and features (SD slot,S-Pen, fast wireless charging). It’s just objectively not a good value at that price, they need to get it down. Also Samsung has a deal where you buy Note 9,S9,S9+,you either upwards $600.00 off the price or Samsung gear,you either buy lock or unlock phone,all the details is on Samsung site.This a new deal Samsung has,only until 11/3. Sorry my bad,this new deal Samsung has going on,until Nov 3. The Note 9 is an amazing phone, but what I can’t stand about Samsungs is the excessive bloatware, including apps that do the exact same thing as their superior google counterparts. Samsungs also delay too much on Android letter updates. Bixby is a joke compared to Google Assistant. I honestly thing Samsung should go the route Motorola does, and run a near-pure Android, or at least give people the choice. The Pixel 3’s camera looks beyond amazing, and I absolutely love the pictures my Pixel 2 XL takes. I’m going to wait for the Pixel 4XL because I’m still very happy with my 2 XL. After a year, my 2 XL runs just as well if not better than it did on day one. Super responsive, with AMAZING all day battery life. Running Android 9 Pie October update. True. You get a little more freedom with the US unlocked model which is why I went with it vs T-Mobile brand. I have been getting timely updates with the unlocked as well and a few extra the T-Mobile variant doesn’t get. I use the Android apps DUO and messages and disable. The camera is just as good as the pixel 2 on the Note and takes better low light pics. Pie is right around the corner for the Note they already have a beta and my girl has the Pixel 2 and pie is causing her phone to overheat and battery issues so having the latest isn’t all it’s cracked up to be. I would imagine unlocked is definitely the best choice since it cuts out the middle man (carrier) for updates. According to DXOMark, the Note 9’s camera is outstanding, so I feel ya on that. Oneplus please save us from ugly overpriced phones. Google is the designer of these phones,they go to HTC to put them together. Ok,thanks. I google what was the different between Pixel and Nexus,what I read was that HTC was the builder of Pixel phones.Maybe Google will be going to different companies build them from now on? Several.companies made Nexus – Samsung LG Motorola. I think LG made the most models with 3 N4 N5 N5x. Of these 5 was a brilliant phone. 4 was OK but a good value. 5x was fantastic until it bootlooped and almost all of them did. Yeah man, I had my Nexus 4 from Nov 2012 (launch) until March 2018 when I got a Pixel 1 5″ from a co-worker. I had a Nexus 5 for a 6 month stretch in there, both phones were awesome but that Nexus 4 wouldn’t die and is still going but 5 1/2 years was a long time so I’m loving my Pixel now. I might just wait till next year then and get the Pixel 4 on TMo with payments. I hear you,I am in the same boat,but with the Note 3,finally got s8 off swappa for great deal and price,but since Samsung has that deal for Note 9($400,Off for S8) up $600.for other phones,it goes from $100 to $600,depending on the phone you trade into Sam.Going to jump on it before it is over 11/3/. My Note 3 will simply not die,but no more security updates,stuck on 5.1. So it is time to retired it. It service me well. Mmmmm,it seem Lg highend phones have bootlooped problem,keep reading on here people are fed up with it,but mid range phones they made don’t have that issue it seems,wonder why. Camera and call AI is neat. Google produces the ugliest high-end smartphone line out there and I have no idea why are they doing what they’re doing. Even Oppo produces a much more appealing hardware despite it being cheaper. They’re not the prettiest, but not the ugliest, my two cents. I think the draw is being a pure Google experience with quicker software updates. However, I’ll concede that Moto, LG, and even Samsung have pulled back their UI quite a bit to emulate a pure(er) Google experience as well. Is it compatible with the T-mobile 600mhz networks? “When it comes to wireless connectivity, the Google Pixel 3 and Pixel 3 XL include support for LTE bands 2, 4, 5, 12, 66, and 71, as well as features like 5x DL CA, 4×4 MIMO, 256 QAM for downloads and 64 QAM for uploads.” Band 71 is 600MHz LTE. To answer your question, yes it is. T-Mobile users will be very happy! Is 700 mhz in that list too? Yep. It supports pretty much every LTE band in the USA and much of the world. I just got my 3 XL yesterday, and honestly the notch isn’t that bad in person! The camera is a dream! The last pure Android phone I had was the Nexus 6 back when T-Mobile had it. I love the fact that it plays nice with T-Mobile’s network! I also love the fact that there’s no T-Mo bloatware, or Samsung bloatware! It is a very worthy upgrade to my S8+!